A SQL Server audit can be performed using various number of methods. This includes using the built-in SQL Server Audit feature, using third party tools from the SQL Server market or simply perform the audit task using the legacy methods manually. In the previous article of this series, SQL Server audit overview, we discussed the main concept of a SQL Server audit, the importance of auditing the SQL Server instance changes and the SQL server audit checklists. In this article, we will go through the manual procedures for auditing the SQL Server instance. There are two limitations of the C2 Auditing feature. One is that there is no option to choose what to audit, as it audits everything, and two, there is an issue of where to save the generated TRC files, because they will be automatically saved into the default DATA folder of the installed instance. It is recommended to keep an eye on the generated files, where a new trace file will be created when the size of the current file reaches 200MB. If there is no purging task configured to control these trace files, the database folder may run out of free space. To perform a SQL Server audit by reading the generated TRC files is a time consuming process, as you need to go through all files generated during the period of time you plan to audit, in order to find the activity, you are interested in. You can imagine the time and effort spent checking the trace files generated from a heavy transactional system. Each database administrator has a secret library of scripts, that helps them in administrating and monitoring the different aspects of a SQL Server instance. This includes queries used to monitor SQL Server performance and track the activities and changes performed at both the SQL Server and database levels for auditing purposes. The same approach can be used for a SQL Server audit. You can see that SQL Server provides us with large number of ad hoc queries that can be used for SQL Server instance level and database level audit purposes. Auditing the SQL Server instances manually by executing the T-SQL ad ho queries is a time-consuming auditing process and not easy to cover all possible auditing events. In addition, you can automate that auditing method by combining it with other reporting tools, or simply the SQL Server Reporting Service, to receive the auditing reports periodically and automatically without the need to run it manually by the database administrator. For low budget auditing projects, it is a good option. 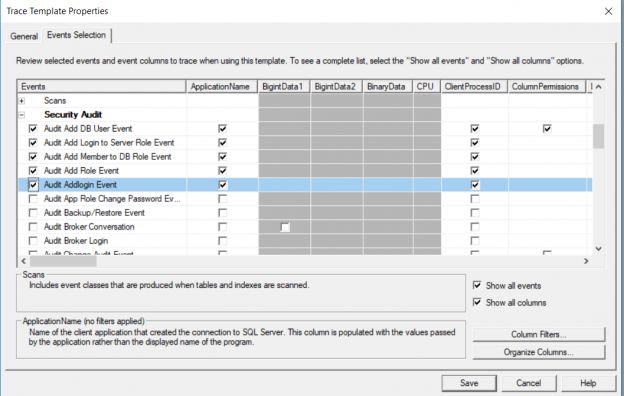 Auditing the SQL Server instance using the SQL Profiler is a great option, especially when the events and properties are selected properly and filtered to collect the requested information only. This will help minimizing the size of generated trace file and making it easier to analyze the events. The trace also can be written to a specified database table for future analysis. SQL Server Profiler cannot be considered as a long-term auditing solution though, as it will be eventually deprecated by Microsoft. But the happy news is that it can be easily replaced by a most powerful feature, called Extended Events that will be covered in the next article.